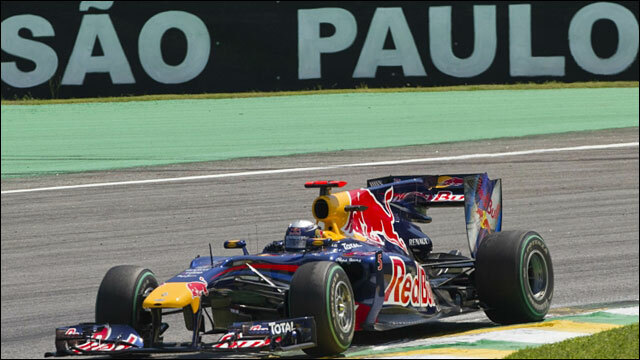 Sebastian Vettel led Mark Webber to a Red Bull one-two in the Brazilian Grand Prix to take the world title fight to the final race of the season. Ferrari's Fernando Alonso took third place to retain the championship lead from Webber and Vettel. Red Bull's formation finish ensured they clinched the constructors' championship for the first time. Lewis Hamilton was fourth and retains a slim title chance while Jenson Button's fifth means he cannot retain his crown. Alonso can afford to finish second in Abu Dhabi and still take the title if Webber wins, or fourth if Vettel does. Hamilton is 24 points adrift of Alonso and would need his rivals to all have disastrous final races to win a second drivers' crown. Alonso leads Webber by eight points and Vettel by 15. Vettel said: "I don't wish anything bad to happen to [Alonso], but it would be nice if we see some nice Ferrari smoke. No, joking apart, we try to win the race and we see where he is." Vettel, 23, dominated in Brazil after taking the lead from surprise pole position man Nico Hulkenberg of Williams at the start. Webber followed Vettel past the Williams at Turn Four on the first lap, and the two Red Bulls romped away. Webber, who was having to nurse an overheating engine from about mid-distance, was never more than three seconds behind but although he pushed his team-mate hard, Vettel was always in control. Webber said the engine was "right on the edge". Vettel said: "It was an incredible day, not easy to start with. I was on the dirty side but got a good start and I saw Nico [Hulkenberg] had wheelspin. "He didn't give me a lot of room but then it was OK. I could cruise into the distance and control the pace. It's an incredible effort from the team. It has not been an easy season, but this was the perfect answer after what happened in Korea." Webber added: "I had a very hot engine in the second half of the race for some reason, so had to focus on keeping Fernando at bay." "I'm absolutely stoked for the guys [at Red Bull's F1 base] in Milton Keynes - to get the constructors' championship is a phenomenal effort. We are racing against Ferrari and McLaren and we have beaten then fair and square." The action was all behind the dominant Red Bull duo as Hulkenberg tried in the early laps to hold off Hamilton and Alonso. Hamilton lost fourth place to Alonso when he made a mistake in Turn Four, ran wide, and the Ferrari driver was able to duck inside him and pass. Alonso then began to apply the most intense pressure to Hulkenberg, repeatedly exiting the Juncao corner on to the pit straight right behind the Williams. But the German defended stoutly, taking the inside line into Turn One every time. Alonso realised that he needed to try a different tactic, and on lap seven he held back in Turn One so he could be closer along the back straight into Turn Four. That forced Hulkenberg on to the defensive on the dusty inside line, making him slow into the corner and allowing Alonso to force his way past on the exit. "That was beautiful," Alonso was told on the radio by his race engineer Andrea Stella. "Now we can use our pace." But the Ferrari was not fast enough to challenge the Red Bulls and Alonso settled in to a comfortable third place as Vettel and Webber pulled away. Alonso admitted: "We lost too much ground in the first laps of the race trying to overtake Hamilton and Hulkenberg. Those 10-12 seconds were impossible to catch. We were very close on race pace. "We had a little chance when the safety car came out but we found ourselves in the wrong position again with six or seven cars between Mark and us. In terms of points we are extremely happy." 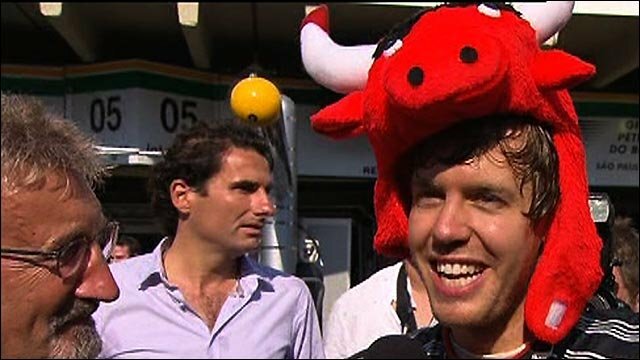 The Spaniard added: "Congratulations to Red Bull - to be constructors' champions is a great achievement. But we will see what we can do in Abu Dhabi." It took Hamilton another six laps to pass Hulkenberg, and his concern now became his McLaren team-mate Button rather than trying to close on Alonso. Button, starting in 11th place, made an early pit stop for tyres from 10th place on lap 11 to get out of a long line of traffic that was being held up by Hulkenberg. That gave him some laps in clear air, and he made the most of them, so that by lap 20 he had made up so much ground that Hamilton would have lost fourth place if McLaren did not pit him for his own fresh set of tyres. Hamilton duly pitted, and rejoined just in front of his team-mate. Button's pace on his new tyres triggered a strong of copycat stops from the midfield runners, from which Hulkenberg emerged as the big loser. Pitting from fourth place on lap 13, with a chain of several cars behind him, by the time the pit stops were done, he was down in 10th, lacking the dry pace to stay ahead of his rivals. Sauber's Kamui Kobayashi, Mercedes driver Nico Rosberg, Force India's Adrian Sutil and Michael Schumacher's Mercedes were all able to get past him. A safety car on lap 51 spiced up the action by giving McLaren the chance to make a last throw of the dice. Both cars were able to stop without losing position, Hamilton choosing a fresh set of the harder of the two tyre options and Button some grippier new 'super-softs'. But the safety car changed little. The front runners were separated from each other by backmarkers and by the time the McLaren drivers were behind the Ferrari on track, Alonso had more than enough pace to hold them off despite a string of fastest laps from Hamilton. Vettel, meanwhile, seized the opportunity to demonstrate his superiority with some fastest laps of his own to pull rapidly away from Webber. 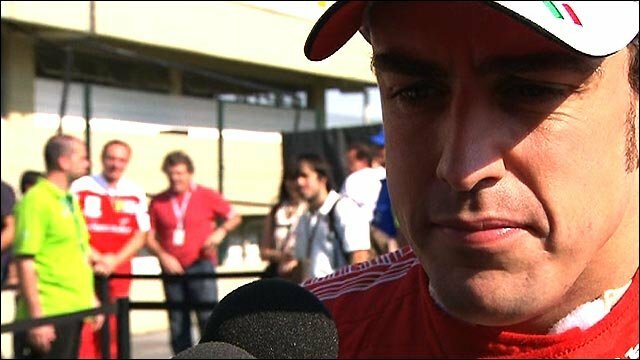 The Australian had to concern himself more with Alonso, who began to close on him, but was able to keep the Ferrari at bay. The final points places were taken by Rosberg, Schumacher, Hulkenberg, Robert Kubica's Renault and Kobayashi.